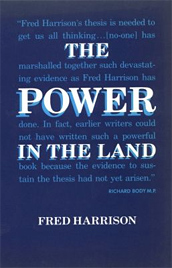 FRED HARRISON is Research Director of Land Research Trust, London. After a career as a Fleet Street investigative journalist, he became advisor to a number of Russian academic and political bodies, including the Duma (parliament), in their efforts to implement a more equitable transition to a market economy. Recently he has turned his attention to the failure of economic analysis and public policies in the market economies. The author argues that land speculation is the major cause of depressions. He shows how the land market functions to distort the relations between labour and capital and how land speculation periodically chokes off economic expansion. This book is as relevant today as it was when it was published in 1983. The author draws attention to a remarkably regular 18-year cycle in the land market which is a major cause of the endemic boom and bust, so characteristic of the ‘free market’ economy, and the maldistribution of wealth. His comparative study of the land markets in the UK, the US, Australia and Japan showed how despite variations in the four national economies, they were all subject to the same systemic defect which makes booms and busts inevitable and predictive. His warning about the collapse at the end of the 1980s proved correct, land prices in Tokyo having risen so high even embassies had to abandon their offices because rents were too high. Japan had not fully recovered by the time the next crisis hit at the end of 2007. The remedy proposed by the author is a fiscal one which would remove the disruptive factor of land speculation and transfer the burden of taxes from labour and capital to economic rent, a publicly created revenue. This would create employment and higher growth rates, while avoiding the inflation-risk policy of deficit financing; increased consumption and investment would be generated by the private sector, not government. In 1909 Winston Churchill explained the issue in a remarkable speech which pointed out, as Adam Smith and many others have, that those who own the land skim wealth from everyone else, without exertion or enterprise.